The original Disney Princess is here to help your next Halloween costume look amazing when you shop for Snow White Costumes! Whether you're shopping for yourself or trying to find the perfect look for your little girl, there are plenty of sizes and styles you can use to make your night of trick-or-treating, or going to Halloween costume parties, perfect! Though it may be a twisted tale of jealousy, Snow White and the Seven Dwarfs is one of the most recognizable fairy tales of all time. This classic and timeless story will always be a perfect choice for your next costume party. With so many variations and new stories like Snow White and the Huntsman, this tale never gets old. 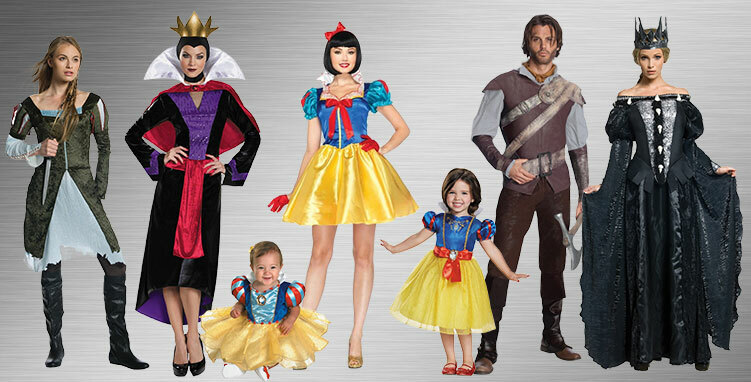 No matter which character is your favorite, you can play the part in style with elaborate costumes for everyone in the fairy tale, from Sleepy to Snow White herself. And every girl wants to play the part of a princess at some point in her life, so BuyCostumes has Snow White gowns for princesses of all ages. You will certainly look amazing in this get-up, because you never know when your Prince Charming will come along to wake you up to the rest of your life. Jealousy is an evil beast, but you won’t be the one filled with envy tonight. Everyone else at the costume bash, however, will have to battle with the green-eyed monster because you will simply steal the show when you dress in this perfect Evil Queen costume. You will instill fear and drop jaws just by walking through the room. You don’t need an apple to cast your spell on this party, because everyone will already be under your spell. Every little girl dreams of being a Disney princess. This year your little girl’s dream can come true. She will be singing a sweet melody in this elegant gown that makes her feel like the fairest in the land. Whether she is befriending everyone she comes across or sending coins down the wishing well, your little girl will be the spitting image of this beloved Disney princess. 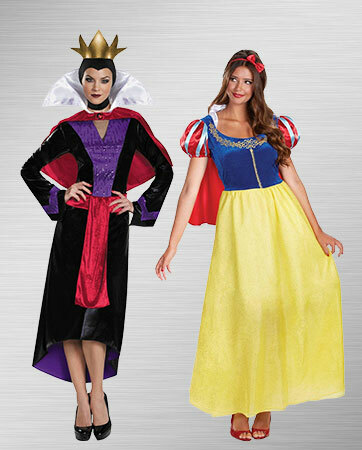 If you have fallen for the fair skin, dark hair and vibrant lips of Snow White, this is the perfect costume for you. While the Huntsman was originally meant to take Snow White’s life, he quickly shook himself free of the Evil Queen’s instruction and saw Snow White’s true innocence. The Huntsman is possibly Snow White’s most important ally, because if it weren’t for him she probably wouldn’t have lived to see another day. The mirror won’t need to fib about who is the fairest of them all any longer. You will be a sure-fire knockout in this dark and ominous costume. With a stunning gown and regal crown, your power will be undeniable once you walk into a room. No magic potions or poison apples necessary. Everyone will agree that your look steals the show because we all love a little element of danger, especially on Halloween. No fairy tale is complete without a classic battle between good and evil. Whether the protagonist is trying to hide from the villain or they directly confront each other, this essential element gives the story intrigue and mystery. Villains are the ones we love to hate. With their slippery ways and menacing threats, they show us their twisted minds and tunnel-vision desire to complete their goal. 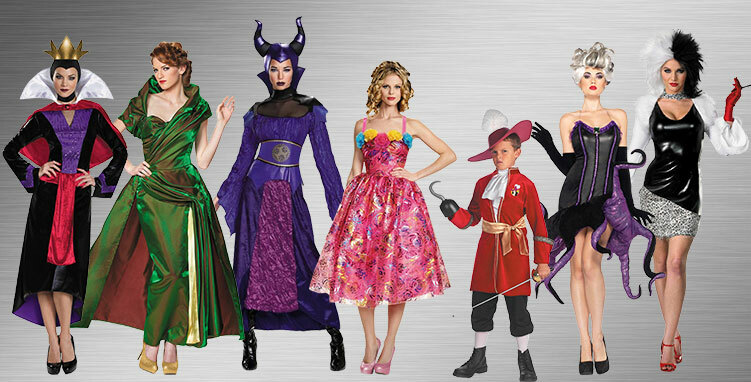 Whether you are drawn to Maleficent’s magic or Cruella De Vil’s greed, any of the infamous Disney villains will make for the perfect costume. Make the display even more menacing by bringing all the villains together for a group costume! After Snow White lost her mother, her new stepmother was less than nurturing. Overcome by jealousy and hatred, the Evil Queen was determined to take Snow White out of the picture so she could be the fairest in the land. When you and your friend rock this costume duo, the mirror on the wall will be stumped. There won’t be just one who is the fairest of them all because you both will look great. Ready to give everyone a fright? This ultimate pair of villains will keep everyone on their toes. 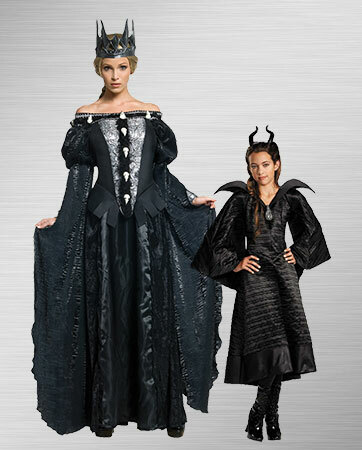 From two Disney classics, the villains Queen Ravenna and Maleficent are the perfect pair for a fabulously frightening night. Just don’t expect anyone to want to go bobbing for apples or pinning the tail on the donkey with you two around. 1. Splendor Adult Boots - Let them know that you are coming. With each ominous footfall, their blood will chill as you come near. And even when you are taking a rest from your evil duties, you will undoubtedly look amazing in these sharp boots. 2. Finger Cuffs - If guests at the party couldn’t tell that you were wicked by looking at your otherworldly beauty and threatening stare, these finger cuffs will certainly tip them off. 3. Bangle Bracelets - Every queen needs a little shimmer with her style. Although you may be dark and ominous, you can still show off your royal taste. These bangle bracelets strike the perfect balance.